either end of his sheet. and looked down toward the street. Bartholomew’s wonderful imagination takes him to an island filled with pirates, then a prep school where he meets a fellow adventurer, and finally to a canyon with no wind. Because of the lack of wind, the canyon is filled with many other people, including Amelia Earhart, who have given up on flying so it seems that Bartholomew may be stuck there forever. But, you should never give up on a little boy with a big imagination! Young readers, especially boys, will love Bartholomew Biddle and the Very Big Wind. The charming story and the rhythm of the words will captivate readers young and old. The beautiful illustrations by Matthew Myers do much to enhance this wonderful story. Aimed at 6 to 9 year olds, this story is sure to be treasured for years. 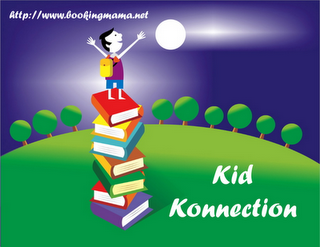 For more children’s books reviews, go to Booking Mama’s feature, Kid Konnection. If you’d like to participate in Kid Konnection and share a post about anything related to children’s books (picture, middle grade, or young adult) from the past week, leave a comment as well as a link on her site. 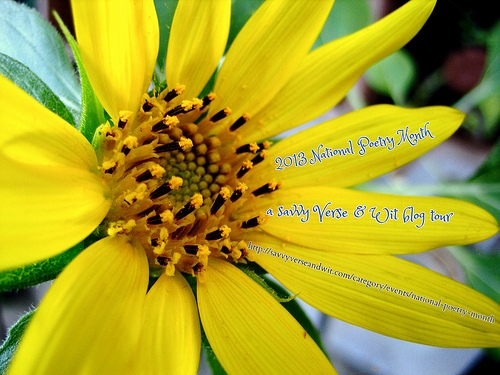 Be sure to stop by Savvy Verse and Wit every day this month to see more profiles of poets and poetry by participants from around the blogisphere! This sounds unique – you usually don’t see rhyming poems telling a story. Great choice! This sounds like great fun; thanks for featuring it on the National Poetry Month blog tour! This sounds delightful! Adding to the TBR for my niece when she gets older. Sounds like I need to read this one as well, it’s so hard to appeal to boys 6-9. The author must do a great job. This sounds really cute, especially if its telling a story in rhyme. After reading your review, I looked it up online and ordered it. Sounds Dr. Seussy, although the illustration styles are different. I’ll keep an eye out for it! My son who has such a vivid imagination would love this, I’m sure. We have been reading Dr. Seuss this month and I can’t get over how much we love his rhyming text. Happy poetry month. A good choice for the post. Sounds excellent. It’s hard to find good boy books. A book with poetry and one boys will especially like! Wow! I will keep this in mind as my friends’ children get older. Fun post today, Kathy! This does sound charming! Nice poetry month choice- it sounds like such an adventurous book! I’ll have to keep this one in mind. Sounds exciting! i think I’ll get it too. I love it when things rhyme! this is one that begs to be read out loud!!! Getting young boys intrerested in poetry is a good thing! This sounds awesome … and like it would be fun to read. Kids when they’re very young have an affinity for poetry and a delight in the sounds of words. A lot of times it leaves them (in whole or part) as they get older, which is such a shame. I hope books like these help preserve a love of poetry. Sounds so cute, and kids do love poems as they’re easier to recall and learn.